It's simple to add light fixtures to your ceiling fans. Ceiling fans have become very popular over the last few decades. Their ease of operation and vast array of light fixtures make them versatile in any room. Installing a new light fixture on an existing ceiling fan is an easy project for do-it-yourselfers. It is best to have two people involved so one can hold the light fixture while the other person connects the wires. Installing a ceiling fan light fixture requires just a few simple tools and will take approximately one to two hours. Unscrew the three small screws on the side of the fixture holder section of the ceiling fan. 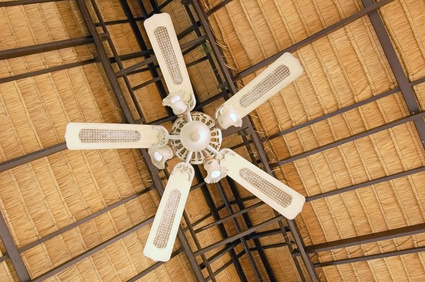 Some ceiling fans may have two or four screws. Remove the fixture holder cap and remove the large screw on the bottom of the cap. Then set the cap to the side. Locate the two individual wires labeled light or light fixture inside the light fixture holder section of the ceiling fan. They usually have a little plastic cap on each wire. Locate the two wires on the light fixture itself and thread those two wires through the large hole of the light fixture cap. Screw the cap onto the light fixture. Hold the light fixture up to the light fixture holder section of the ceiling fan. You'll need help with this. Twist or splice one of the wires from the light fixture to one of the individual wires in the the ceiling fan holder. Repeat this process for the second wire. Twist caps to wrap each wire connection to avoid shorts, using electrical tape. Push the wires up into the fixture holder until the cap is back flush with the holder. Align the side screw holes and reinstall the side screws.